Tomorrow the world remembers September 11, when America became the target of four terrifying acts of war. Two were in New York, one in Shanksville, PA and another in Washington, DC. For my new readers I'd like to rerun the piece Pop wrote about being an eyewitness to history on 9/11/01, when terrorists struck the World Trade Center in NYC. A day that might have changed MY history as well. For a second year, along with Pop's recollections I'm also privileged to share another eyewitness account written by one of Pop's co-workers and friends. I apologize for the length of this post. First, Pop looks back on the horror that unfolded five blocks from his office window. People were running to get their things while I—being the grandson of a firefighter—stood transfixed by what was unfolding at that window. The sight of a box of continuous feed computer paper floating out from one of the broken windows and then slowly unraveling as it made it’s way toward the ground just amazed me. Then I felt the heat from the explosion and I too knew it was time to leave. R and V and some others chose to stay and try to find a phone that worked. My department chose to walk. We wound our way up the East Side of Manhattan looking for safety, being careful to walk along the water and away from the buildings. Somewhere in Chinatown we heard the roar of what sounded at first like another plane and then like a subway train. The South Tower had fallen and what we heard were the floors pancaking. Fortunately, we were far enough from the plume of smoke and dust that we didn’t inhale any of it. We continued to walk until we were in Little Italy when we heard the sound again. This time we turned around in time to watch The North Tower falling. None of us would ever be the same again. None of us will ever forget that moment. It will be hard to forget that 14th Street (about 4 miles from where I work) is where civilization started to appear again only there were soldiers directing traffic. After they descended from the building, Pop and some of his co-workers immediately headed uptown to safety. Robert Tonchuk and his group stayed downtown to look for a working phone. These words are taken from Robert's Facebook page, with his permission and without editing although the names have been removed. 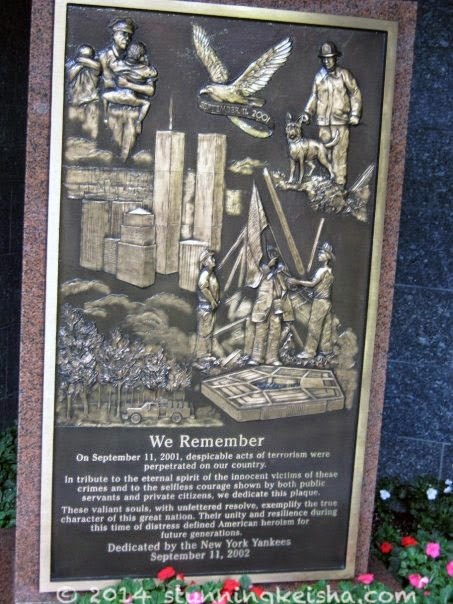 The plaque in Yankee Stadium. watched it fly into tower 2 and our building shook from the impact of it hitting that tower. I remember the windows shaking. I hope by reading these two firsthand accounts of an event that those of us in the NY area won’t ever forget, it makes that day more personal to you rather than just a news story. By reposting this every year, I pray my readers will keep the memory of the 2,983 victims—of which 41% have yet to be identified—in their minds and hearts. I’ve leave you with a link to The New York Times' incredible interactive look at the National September 11 Memorial Museum. Purrz and peace out. What a terrifying thing to go through! The only ones here who were around then were Binga, the humans, and the dog. Boodie had yet to be abandoned in a vet's parking lot and Sparkle wasn't born yet. But it will stick with my human forever. We gets the chills efurry time we read this. You know what's crazy? The freshmen at my Human's school were mostly born in the year 2000--and really none of the students (who range from 13-18) have any memory of the event except what they've been told. The Human says that just amazes her--seems like yesterday to her! I remember where I was and what I was doing when it happened. Of course, I wasn't so up close and personal with all of it. I was in high school... I think maybe the 11th grade. What a terrible thing to experience personally. My momma was in 9th grade when it happened, she came out of morning swim practice and her mom told her. She went back in and told everyone else. All day long in school everybody just watched CNN and cried. My grandpa had a fraternity brother on one of the planes. We feel for so many on that awful day. Sadly the memories for many never leave them. Our hearts go out to you all. This is such a horrifying experience to go through. I remember the day very clearly and will never forget. My heart goes to the victims of this terrible attack and their friends and families. We remember that day so very well but it's truly something to hear eyewitness accounts. Through the years we've read many of them and the images are impossible to erase once seen even after all these years. Thanks for sharing your Dad and his friend's thoughts.....they still move us to tears. We shall always, always remember. What an amazing story, CK. I remember reading somewhere that everyone should write down their experiences that day and how they felt, sort of a "living history" project. I know that I will never forget coming into work that morning, logging onto the Internet, and realizing in an instant that life would never be the same for any of us. Ivor was in the garage working and told me a plane had gone into the tower. I turned the TV on to see what had happened and saw the second plane hit. We were in New York a couple of years later and the cab driver who took us from Brooklyn to our Manhattan hotel told us his sister was in one of the towers but managed to get out. She committed suicide 6 months later. Mommy remembers, but I wasn't born yet. Assassination of JFK, his funeral entourage, death of his brother and Martin Luther King, and the loss of so many people in the Two Towers. I remember like it was yesterday, and think about it quite often since I work every day in Manhattan. Thank you for this important reminder, CK, Pop and TW. We will never forget. Wow gweat posty CK. Meez hope weez nevew furget all da losses dat day includin' sum little piece dat wuz left of ow innocence. I was living in NJ when it happened. I remember it very clearly. My girlfriend and I had tickets to see The Producers on Broadway for the first week of October and we went into the city. A very quiet city but we were not going to let it stop us. CK, the rest of the country does not want to forget, but we are so removed from it without a daily reminder of looking where the towers were. I'm so happy you publish this every year as a reminder of what it was really like. I will never forget the day myself and where I was when I heard the news. It's etched in my memory along with the day Kennedy was shot. I hope to God we never have to experience anything like that again. Thank you for the excellent post. Even though I was far away, I will certainly never forget. I was at work when one of my co-workers came in and told us a plane had crashed into the WTC. Like your Dad we thought it was a small plane. When we went for coffee the television was showing the news. While we watched we saw the second plane fly into the other tower. No one went back to work as we watched. When the buildings collapsed, there was such a sense of fear and helplessness. Eventually we went back to work but not much work got done that day. There was numbness, that turned into fear especially as we heard of the other two events. It could happen anywhere. bless you fur yer thoughty, luffin' post. our ed was just a kitten back then, but he has told us how he nearly drownded frum the tears our mommer leaked. we purrs nuffin' like that will effur happen again! Thanks for re-running this, CK. We will never forget. Wow. What a terrifying experience. 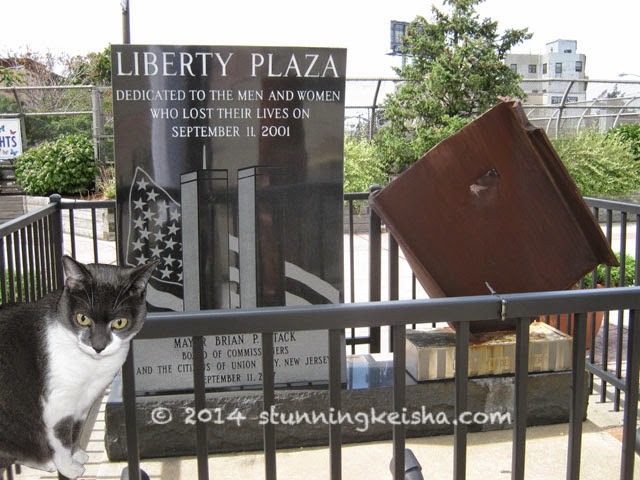 We will never forget - Mom remembers where she was and what she was doing when it happened. She had just walked into her 6th grade English class, only to find the TV on with footage of a smoky building. A classmate of hers had family that lived in NYC, so she borrowed the teacher's phone to call her family and make sure all were alright. What a tragic day…. our thoughts and prayers go out to everyone who lost a loved one or who had to experience that attack first hand. Great Post CK! Your Daddy is furry eloquent. My Mommy is purrhaps the only person who does not remember that day. It happened after Mommy had a severe head injury and she remembers nothing of that day or the next 6 months). Very powerful post CK. Thank you for sharing this. My heart goes out to you all. CK, In answer to your question today--I'm not 'zackly sure. Let's say, Yes, I did, though. Just for the heck of it. My boss had gone home for lunch and phoned me an told me to put on the TV in the office. We couldn't believe what we were hearing and seeing. It is a day we will never ever forget. Thank you for re-posting this. We do need to always remember! The Staff was on holiday from work and was visiting Castle Drogo near where she lived when her mother phoned her to say what had happened. the Staff, being very thick, didn't really take in the enormity of it until she got home and put on the TV. She spent the rest of the day trying to take in the horror of it all, but I don't think you can unless you had been there! A very eloquent post by Pop and his colleague, CK. The events that took place that day changed the world for ever! There is nothing more powerful than a first person account like yours. We must never forget. Thank-you posting and shared with love. We will always remember that day and what we were doing when we heard about the first plane....and then watching the 2nd plane hit. For some reason, this anniversary has hit Mom really hard and she's been super leaky eyed all day. 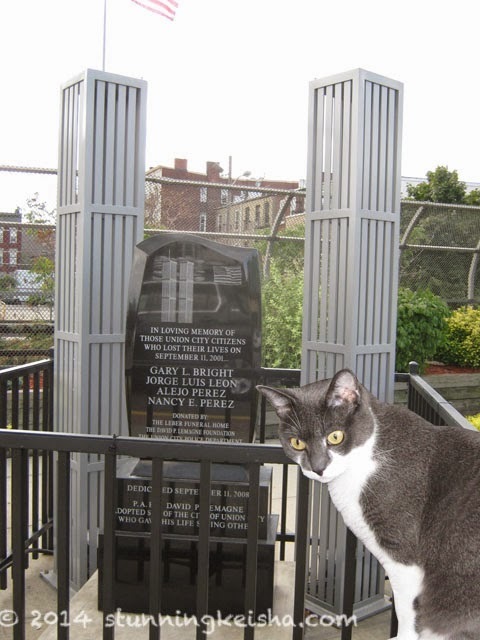 Someday she might go back to her town in NJ to visit and make a trip into the City to see the memorial. I worked in downtown Washington DC at the time. We were in an old concrete building, and I felt the thump when the plane hit the Pentagon (not knowing what it was at the time of course). My office had an emergency function, so there was a TV in a conference room. When the 2nd Tower went down, most people watching thought it was a replay of the 1st, but I saw there was a difference. We were all so silent. Thank you for sharing this and keeping everything in perspective. It was a day most of us won't forget. My memory involved a co-worker who was in law enforcement. He called me minutes after the plane crash, completely in shock, telling me over and over that he couldn't believe it... he was standing in the midst of ashes and errant pieces of body parts... We must never forget. 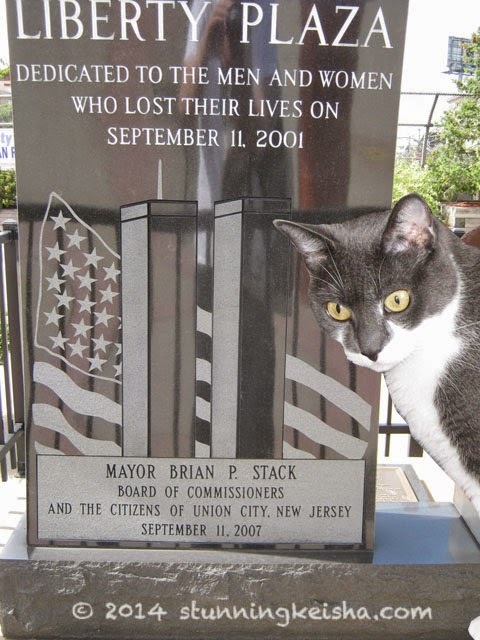 Our niece walked over 90 blocks home that day...she worked just a few blocks from the towers. Thank you for sharing these close encounters of that horrific day. I was safe in Michigan at the time. I had just come inside from painting a Peace Pole out in my yard and decided to watch some news while taking a break. What I saw was surreal, and then I watched, live, as the 2nd plane hit. Wow. Unbelievable. I'm glad for your safety and those around you. I wish you Peace.